Justine Olsen, Curator of Decorative art and design, provides a fascinating insight into the preparation for the Throne of Emperors exhibition, opening 22nd March. This Saturday two important exhibitions open to the public: China: Throne of Emperors and Shi Lu: A revolution in paint. Developed by the National Museum of China in partnership with Te Papa, each exhibition charts aspects of Chinese cultural and political history. Throne of Emperors is a historical sweep through 2000 years that finishes close to 1800: the reigns of seven emperors lie at the heart of the exhibition. 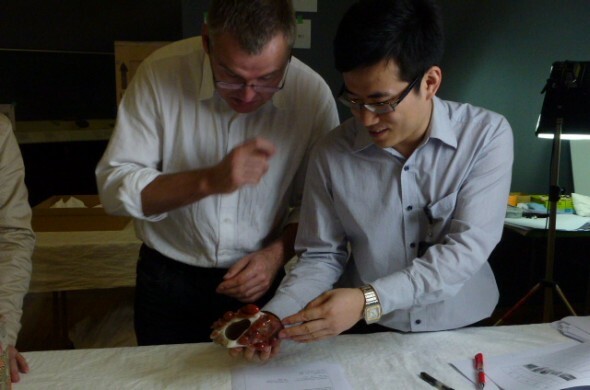 Over the last few days curators, conservators, installers and collection managers from both National Museum of China and Te Papa have been involved with the lead up to both shows: unpacking, condition reporting and installing the large and small treasured objects that make up the exhibition. 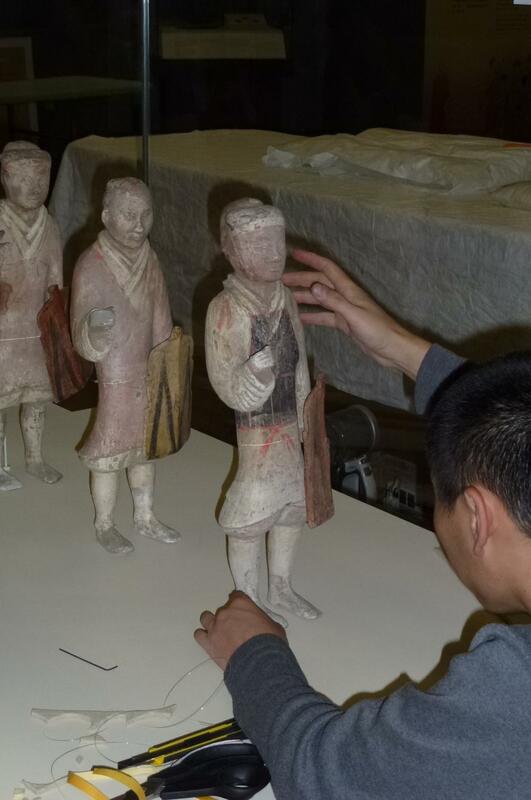 These tasks are systematic and thorough; objects checked as they are inspected, photographed, mounted and eventually placed into cases. Two thousand years is a long period of history to consider in one exhibition. We show objects that reflect daily and ceremonial life from the dynasties of seven emperors between 221 BCE to 1795. Below is a pottery soldier from the Han dynasty (202 BCE- 220CE) wrapped and secure in its box awaiting attention. The foot soldier was one of an army of 2,500 that had stood near the mausoleum of the first Han emperor, Gaozu. Intended to protect the Emperor during the afterlife, the soldiers armed with shields and swords were ready for combat. 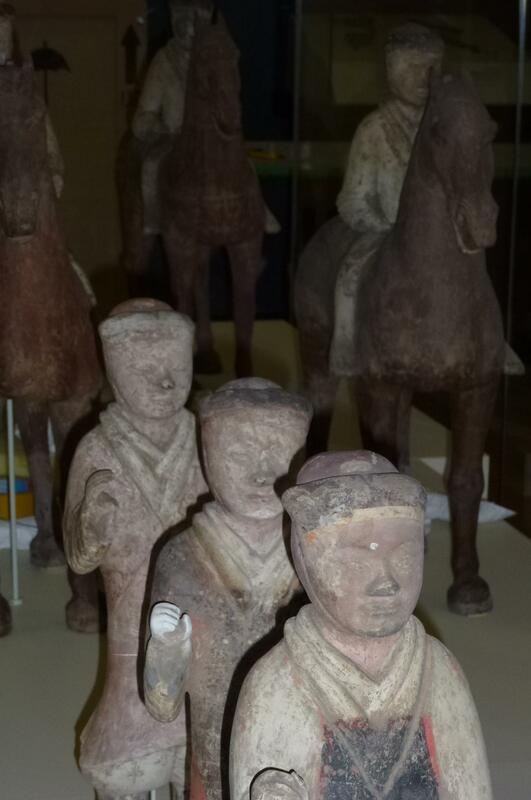 Afterlife was a serious preoccupation for the Chinese Emperors of the Han and Qin dynasty. The first Emperor Qin, who unified China, created the renowned terracotta soldiers for his enormous tomb that was said to have been filled with models of palaces, towers and soldiers with crossbows set to shoot any intruder. The foot soldier is now unwrapped, shield in hand ready for imperial duty. 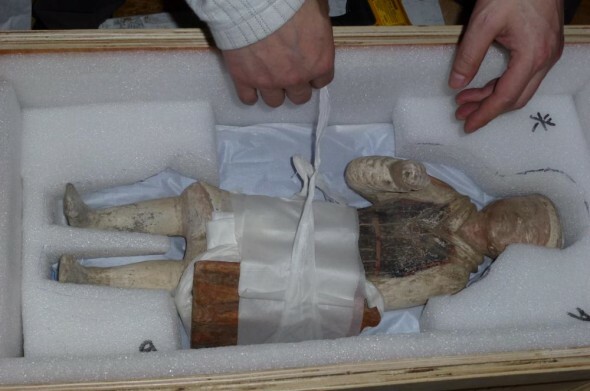 Our colleague from the National Museum of China places the figure in the large case already filled with riders and horses. It’s a majestic setting that that speaks of another world from 2000 years ago. Visit www.tepapa.govt.nz/china to find out more and book your tickets. What year, did Wellington have on display the Terracotta Army please, I can remember viewing it, was living in Wellington then, been away from the area since 1991. So it must have been at the old Dominion Museum? thank you.